One of the reasons I love these small scale adventures is all the cool gear you can get that is funtional. 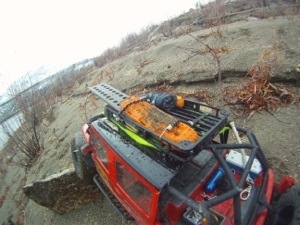 Sure I like the ice-chest and tool box that bounces around in the back of my mini Wrangler, but to have items that really work like tow straps and winches are pretty awesome. I picked up my first set of sand ladders just before my first G6. 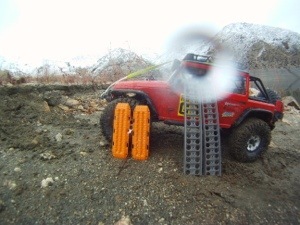 For under $20 I had a set of MaxTrax sand ladders like my big scale rig has. They were used within the first 15 minutes of the start of the G6 in Bend, Oregon when after working our way through a maze of mud and sludge, we had to climb over a few ruts that was giving other drivers fits. I pulled the ladders off the roof rack of my little Jeep and Abby and I glided over easily where others were getting stuck. I had noticed at the starting line at that first scale adventure how many different types of ladder systems there were. Many had been home built, while others were definitly manufactured. All had something in common, there were all longer than my set. Over the next week I struggle to make a set of my own. They either looked great and were non-funtional, or were perfect bridging devices that looked like a sixth-grader’s shop project gone wrong. 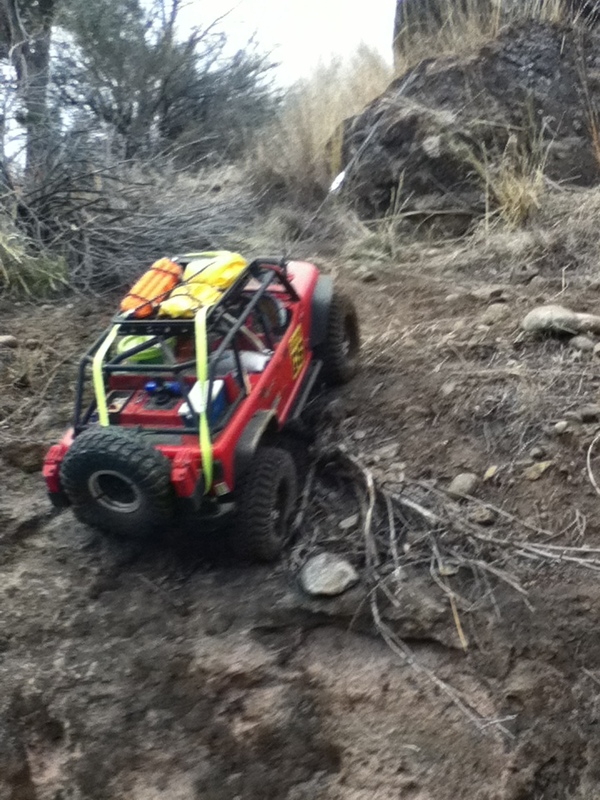 I went into my second G6 in Sparks, Nevada with my MaxTrax. 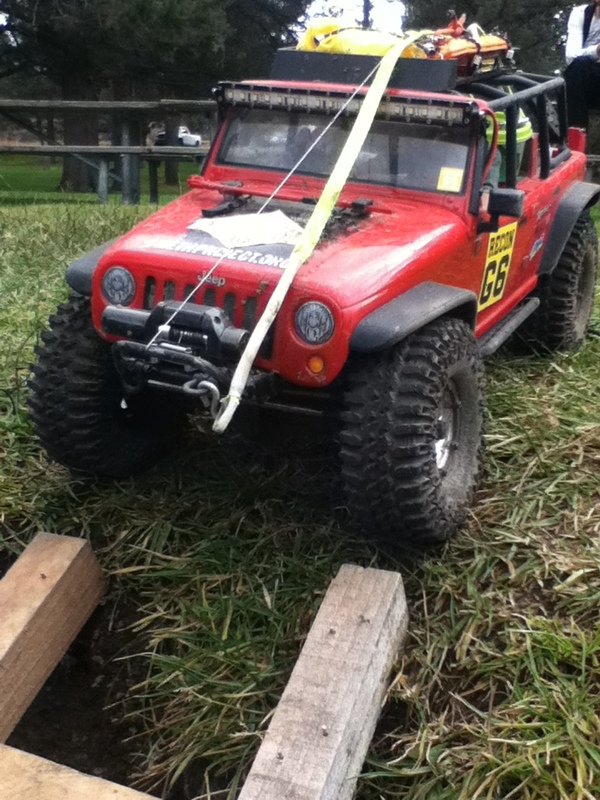 I used them a few times either alone to bridge or decrease an angle of attack or to help with my winch on an obstacle. They were fine until We went into the night course, which had a route that took us through a parking lot. Going off the curb….no issues. Going up and over a curb, my little orange bridges were too short and I wound up following another driver up his home-made bridges that were twice as long. The following week I ordered a set of Siege Ladders from DS Pro. Twice in length and slightly less expenseive, and regionaly made from a great guy over in Oregon. I decided to test them right away. 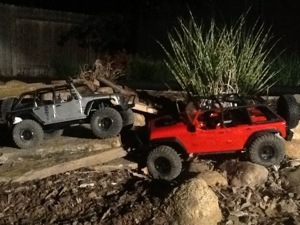 1) Scale Look – Here I think the MaxTrax wins without question. This is probably due to the fact I have a set for my big rig. They look like the actual ladders in production. With that said, since MaxTrax is also made in blue, black, and grey there should also be options for the other colors. The DS Pro looks good, and I hate to down grade it here, and as you will see in a moment…form does not discount funtion. 2) Durability- Before I comment, I have to give huge props to DS Pro here. In transit my ladders showed up warped. Probably happened in the mail along the way. Within 48 hours DS Pro not only had a new set to me, but was looking for ways to help me salvage the other set. I have had issues with other RC accessories and service has been hit and miss…DS Pro takes care of its customers. Because of the geometry of the MaxTrax, there is less space for flex, especially when under stress of bungee cords. In addition, they use a concave shape to help strengthen overall load. They also have reinforcement on the long-axis of the ladder. There are small cutouts along the edge for mounting with a bungee, and under minimal stress, have either torn or stretched out of position. The DS Pro ladders are longer and more suseptable to flex. They have smartly placed reinforcement along the two outer edges so there isn’t hardly any flex when under load. They have also been on the rig as it took a 30 foot tumble down the side of a rocky bank and did not break or bend, eventhough they protrude beyond the roof rack. I would like to see a slightly different plastic formula used since it is suseptable to bending like it did in the mail. I am curious as to what it will do in the summer. It does not seem at risk of snapping in cold weather. I drove today for about 6 hours in temps ranging from 29° to 36° and used the ladder for testing…no cold temp issues. 3) Usability- This is tough. Most likely, each has its specific place that shines, but here is where the Siege Ladders shine. The ladders not only long enough to bridge large gaps and provide a much better angle of attack, but are long enough that you can shove them deep into soft dirt or sand and they will stay in place as you transition out of the rut you are in. I will carry both sets, but if I had to pick one, I would most likely use the DS Pro product based on this alone. 4) Traction- for both sets, tracting was an issue, though the dimples on the MaxTrax were only slightly better. Only slightly, because with the siege ladder you have more options for angle of attack. Change the angle so you aren’t trying to drive as steep out of the sand trap. If there was some grip on the DS Pro ladders….outright awesome. 5) Overall Satisfaction- Again, if picking one…DS Pro. I really like the look and the ease of mounting of the MaxTrax, but for the reason of needing a ladder for urban and rocky environments, I would have to use the longer ladder. The other reason is simply the company taking care of me. I work hard for my RC gear and I hve to do it for Abby and Melissa as well (not always same brand- just same option), and when a company steps up to take care of me, it means allot. With that said, I am sure RC4WD has some fine folks working there. But with our winch projects, I have already seen a lack of insight, like putting screws to mount the winch to the bumper in the packets or at least telling me up front I would need them. Still, they have a history of making great products. You can’t go wrong with either set. MaxTrax look great and will do most of the work. Siege Ladders, best all around and will be my go-to set when I am stuck. Be sure to check out our Facebook page for the video of these guys in action and be sure to tune into our podcast for more info on these and other adventures. 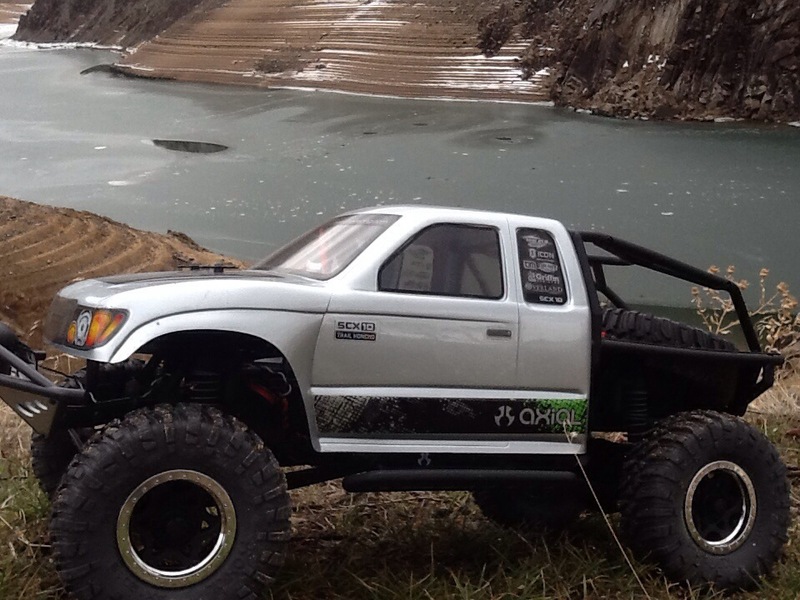 This entry was posted in Adventure Aggregate, RC Expeditions and tagged adventure, axial, off-road, rc, reconG6, scale, travel, truck on November 17, 2013 by adventureiq. I know I still owe blogs from the Oregon and Nevada G6 we did….and even an article on what G6 is in the first place. 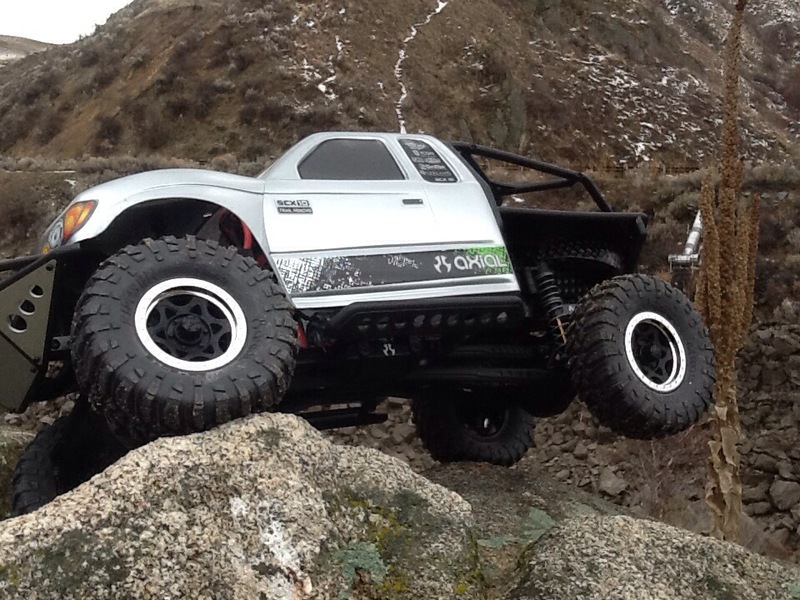 Quickly, G6 is a scale-based adventure specifically for RC vehicles. Not only do the vehicles have to carry small scale items such as fuel cans, ice-chest, etc…but each G6 has a theme. Moonshine runs, transporting scale turkeys, ghost and zombies as support crew, surfing, etc. Each G6 is an all day and night activity requiring drivers to navigate an adventure course. Think National Geographic meets Dakar at a 10-scale level. For more info, check out the interviews on our podcast. Finishing a G6 is like winning a G6. 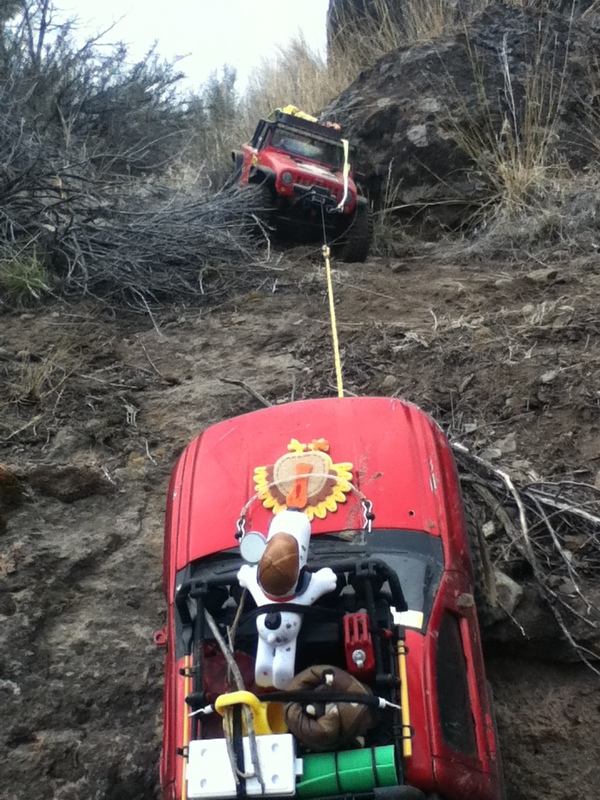 Drivers not only need to drive well, they also need to work together to overcome obstacles, solve puzzles, repair rigs on the trail, even tow each other back…picking up your truck on the course, even to flip it over in a crash is prohibited. 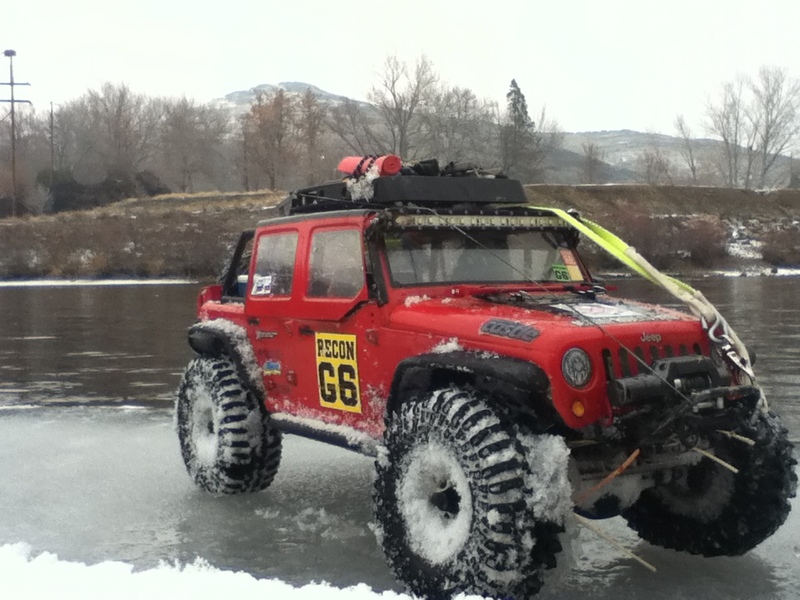 Thisnis why each rig has at least a tow strap…many have winches. 1. I am outside doing adventure and getting my playful and adventurous heart back. For a time, this has been lost. Drowning in work, this (Adventure IQ) project, and other responsibilities, I simply forgot how to play. 2. Working with others. Even my buds know I am a loaner. Granted, in RC I spend 90% of my RC time alone or with Abby and Melissa, the G6 gets me out socializing with others. 4. Provides quality time with family. We have a new reason to get outside and play. 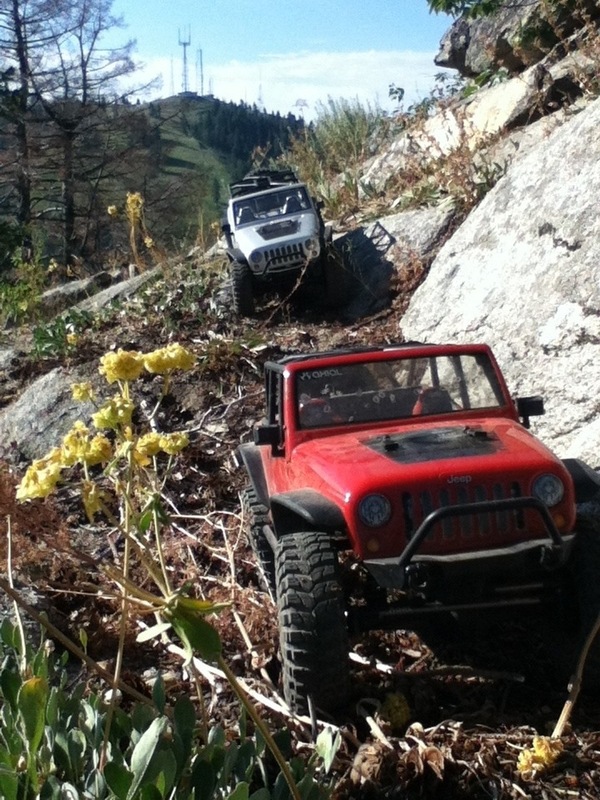 We also work and modify our rigs together and have a common interest. Taking breaks on a trail offers opportunities to talk…serious and not so serious. 5. Travel to new places for new reasons. A big part of AIQ is travel, but now we are hitting new places both local and regional. I found new hiking areas less than 10 minutes from work. We are now going places just to drive in a G6. Probably would have never seen Bend or Sparks if it had not been for going to a G6. 6. The big chill. Melissa’s job requires long hours and sometimes I wait for her so I can take her home. Abby has school events that require a dad to take her, wait for her, pick her up afterwards. I often travel and have nothing to do at night since I don’t run the bars. All this empty time allows me to relax. 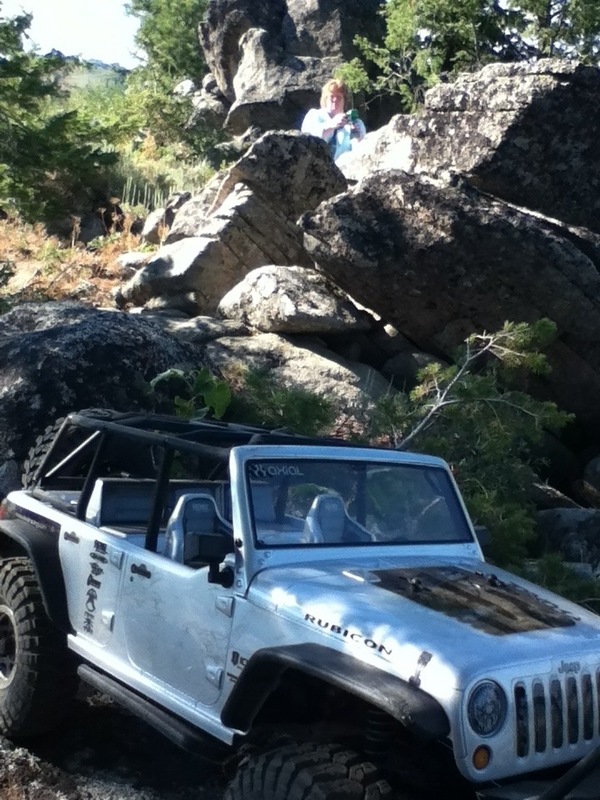 Driving my rig in a rock garden or urban jungle gives me a chance to shake off the rest of the world. I am a better husband and daddy when relaxed. 7. Giving back to the community. Part of this is evangelizing the hobby. Part of this is by picking up trash on the trails.Part of this is freely giving somebody a spare part to get them going again. Part of this is setting up a trail for others in an informal setting. G6 has helped me in all the areas. 8. Recon G6 has made me a better RC driver. The courses set up by Brian Parker, the father of G6 are designed to make you better at RC adventure driving. Anthony Rivas of Rivas Concepts took time during the Paranormal G6 in Sparks a few weeks ago to coach me through a difficult water/boulder section. Other drivers like Will of AwesomeActionRC, Jason of Hoy Fab, and Jed of Back40 RC each have given guidance and support on the course. Being a better driver means I can teach those same skills and coach others now. There are probably more reasons G6 has made me better, but those are the top of the list. This is an amazing hobby and I highly encourage you to get involved. 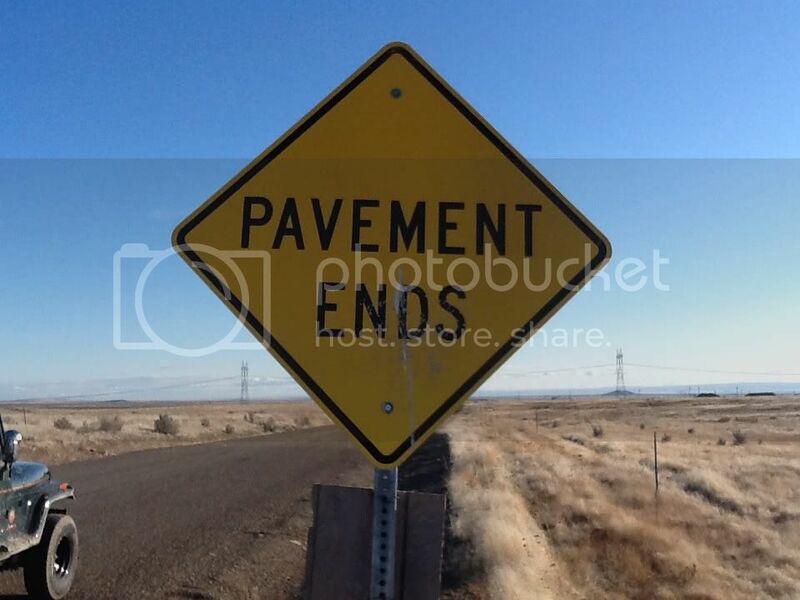 This entry was posted in Adventure Aggregate, RC Expeditions on November 13, 2013 by adventureiq. Most times when traveling for business, I find myself stuck in a town without transportation independence. I have rented bikes, taken taxis and buses, even purchased a moped to get out and see the sights. But for a Jeep guy who is often stuck in a hotel room, well after venturing hours, the immobility is hard to take. Enter the world of RC cars. I have traveled fairly extensively with my 1/16 scale and 1/38 scale rigs. Taipei, Korea, Shenzhen, and Glasgow have all become speedways and crawling courses for my various rc toys. I have found the best way for me to stay out of the troubles is to have something to keep me entertained. Having small rigs to play in a hotel rock garden or a race at a local hobby store on club night is a great way to pass the monotony of travel. 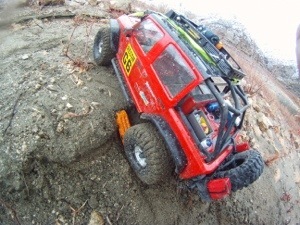 My newest passion has been he Axial SCX 10 Jeep JK. I wanted to test this rig for several reasons. First is that now we own a new JK, I wanted something to emulate my 1:1 ride. The second, I wanted to review a true crawler. While my 16-scale Summit has been modified to play in a few local parks, noting beats a real scale crawler. I have also wanted to find a way to get the adventure crew back outside to both the trails as well as our own backyard. I believe strongly that a family that finds common outdoor activities builds up better protective layers when storms arise. Having a soon-to-be middle school daughter, I wanted both solid insulation for the coming foul weather, as well as make opportunities for time together. As for our matriarch, we just need to get her outside in less stressful environments. For the sake of testing, we went two distinct routes. 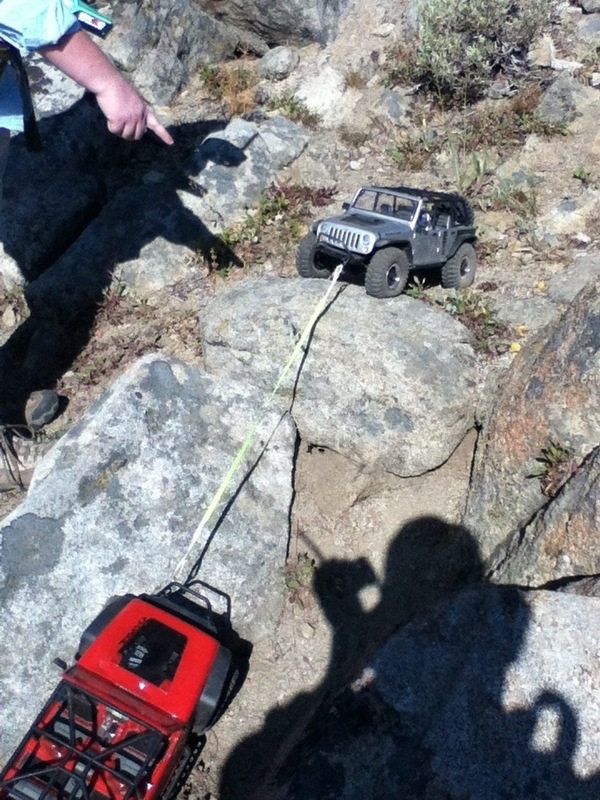 Melissa’s rig is a “Ready-to Run” SCX 10, meaning you pull it out of the box, put AA batteries into the radio controller and NiMh or LiPo batteries on the rig, and you are ready for fun. 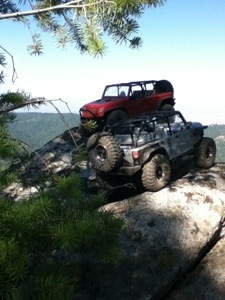 Axial makes solid products and they are truly ready for the trails strait off the shelf. and conversely, higher turn = lower top end/more torque. I wanted the ability to help her control her speed since crawling is more finesse that bashing through stuff. One of her frustrations was always wrecking her Traxxas Slash. Even with a slower motor, she was wrecking it. Moving to a 55-turn motor decreased her speed, and gave her the torque she needed for crawling obstacles. It also eliminated the full speed/ 90 degree turn and flip syndrome as can happen with many high-speed RCs. We also swapped out her controller for a higher grade one from Spektrum. The controller Axial makes is awesome, but I had an opportunity to get her one at a steal so I couldn’t turn it down. The stock Axial is a 2.4 Ghz high quality controller. I resold it within 48 hours. 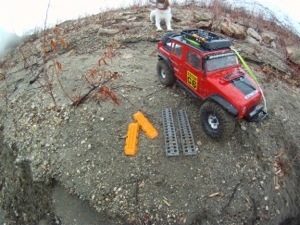 With my rig, still using the SCX-10 platform, we bought a kit. Even though, I have put a few kits together, based on time available and experience, I decided to let Troy Dewey from Team Dewey Hobbies put mine together. He built a great mini-version of my 1:1 rig. I also put in a 55T motor. With the kilt you need to supply all of your own electronics. 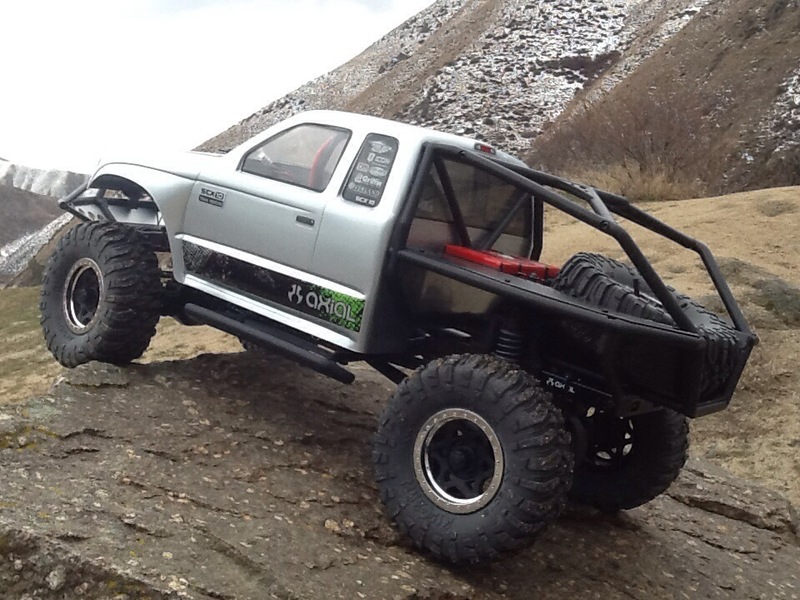 If this is your first crawler, I recommend going with the RTR versus a kit, since you will want to be out there playing right away. Its hard to think of this as a toy at times. You can quickly get sucked into a hobby that no one else understands. The realistic looks and upgrades can quickly turn into an obsession. I hate to think of how many hours I have wasted, errrr…reinvested into thinking of accessories alone. 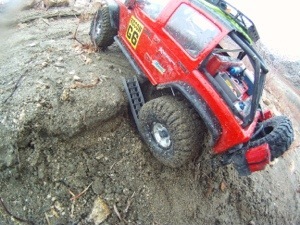 The SCX-10 has phenomenal handling, and with the differentials locked, can climb more than you would expect. The suspension consists of four oil filled coil-over shocks, with dual spring rates, attached to front and rear four- link suspension. 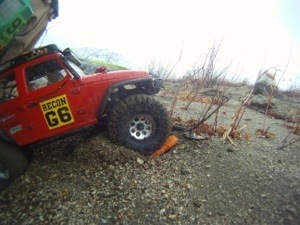 Like its 1:1 counterpart, the spring rate on the RC is preset pretty low, which helps to stabilize it when on the trails or crawling over objects like rocks or wood pallet based obstacles. The absolute coolest thing about the SCX-10 Wranglers is the ability to upgrade ands add accessories. 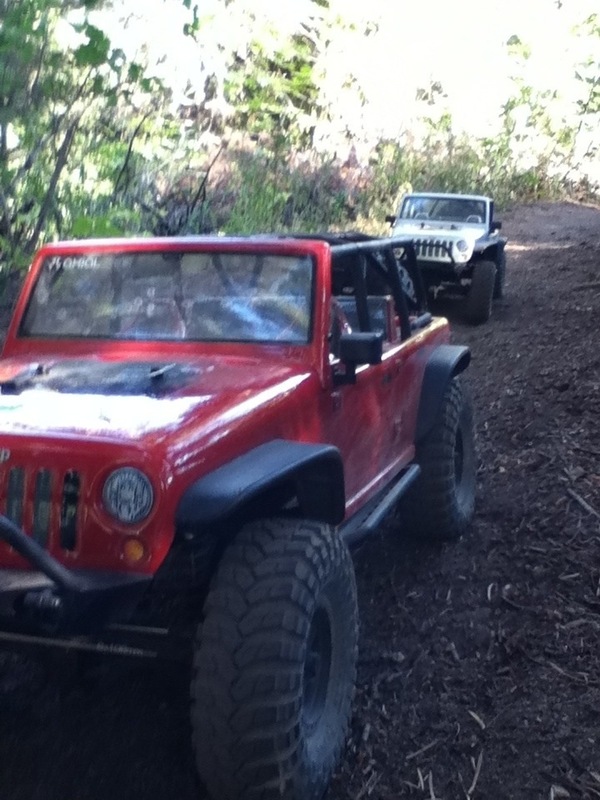 Like 1:1 Jeeps, a true Jeeper can park next to another Jeeper and the two rigs will be completely different. Performance upgrades such as tires or shocks and scale cosmetics like bikini tops, camping gear, roof, racks and working lights make any rig truly yours as you add custom options. Companies such as Rugged Ridge and Poison Spyder have rallied behind this rig to make scaled replicas of their primary products. 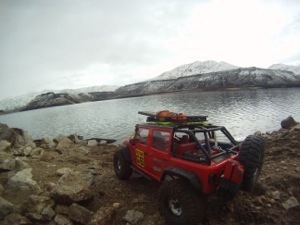 This entry was posted in Adventure Aggregate, Overlanding, RC Expeditions and tagged 10, adventure, adventureiq, axial, control, family, rc, remote, scx, scx10, travel, Traxxas, wrangler on August 13, 2013 by adventureiq.